14th July 1795; "La Marseillaise" ("The song of Marseille") becomes the national anthem of France. It was written and composed by Claude Joseph Rouget de Lisle in 1792 and adopted in 1795 as the nation's first anthem. It is also the first example of the European march style of anthem. Claude Joseph Rouget de Lisle wrote "La Marseillaise" in Strasbourg on 25 April 1792. Its original name was "Chant de guerre pour l'Armée du Rhin" ("War Song for the Army of the Rhine") and it was dedicated to Marshal Nicolas Luckner, a Bavarian-born French officer from Cham. It became the rallying call of the French Revolution and received its name because it was first sung on the streets by volunteers (fédérés) from Marseille upon their entry into Paris on 30 July 1792 after a young volunteer from Montpellier called François Mireur had sung it at a patriotic gathering in Marseille and the troops adopted it as the marching song of the National Guard of Marseille. A newly graduated medical doctor, Mireur later became a general under Napoléon Bonaparte and died in Egypt at 28. The Convention accepted it as the French national anthem in a decree passed on 14 July 1795, making it France's first; but it was then banned successively by Napoleon I, Louis XVIII, and Napoleon III, only being reinstated briefly after the July Revolution of 1830. During Napoleon I's reign Veillons au Salut de l'Empire was the unofficial anthem of the regime and during Napoleon III's reign Partant pour la Syrie. 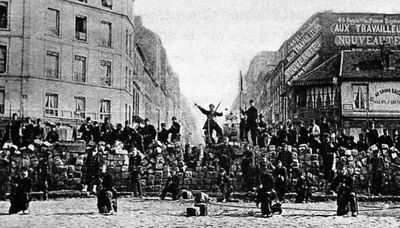 During the nineteenth and early twentieth centuries "La Marseillaise" was recognised as the anthem of the international revolutionary movement and in 1871, it was adopted by the Paris Commune. Eight years later in 1879, it was restored as France's national anthem, and has remained so ever since. "La Marseillaise" was arranged for soprano, chorus and orchestra by Hector Berlioz in about 1830. Franz Liszt wrote a piano transcription of the anthem. During World War I, bandleader James Reese Europe played a jazz version of "La Marseillaise", which can be heard on Part 2 of the Ken Burns TV documentary Jazz. In Peru and Chile, both the Partido Aprista Peruano and the Socialist Party of Chile wrote their own versions of "La Marseillaise" to be their anthems. Le jour de gloire est arrivé ! The day of glory has arrived! Mugir ces féroces soldats ? Those ferocious soldiers roaring? Égorger vos fils, vos compagnes ! To slaughter your sons and wives! Marchons, marchons ! Let's march, let's march! Abreuve nos sillons ! Water our furrows! De traîtres, de rois conjurés ? Of traitors and conjured kings want? Quels transports il doit exciter ! What fury it must arouse! De rendre à l'antique esclavage ! To return to ancient slavery! Feraient la loi dans nos foyers ! Would make law in our homes! Les maîtres de nos destinées ! The masters of our destinies! Contre vous tout prêts à se battre ! Against you, all ready to fight! Portez ou retenez vos coups ! Bear or hold back your blows! Déchirent le sein de leur mère ! Rip their mother's breast! Voient ton triomphe et notre gloire ! See thy triumph and our glory!